I have long maintained that technology standardization is commercial diplomacy and the purpose of individual participants (as with all diplomats) is to expand one's area of economic influence while defending sovereign territory. This week a lot of people are gathering in Geneva for the ISO ballot resolution meeting for Office Open XML (OOXML), Microsoft's Office product specification. The debate no doubt will be contentious. Microsoft had a perfect opportunity to participate in the Open Document Format (ODF) standard's development at OASIS. They ignored that opportunity. The best time for technology standardization arises when a problem space is well understood, with sufficient real implementation knowledge to discern what works and what doesn't. Microsoft had arguably the best experience to contribute. They chose not to participate. Standardized document formats with multiple product implementations posed a threat to their Office business. That threat became real when the Commonwealth of Massachusetts chose ODF as a basis for product procurement to best serve its citizens. Microsoft's response was not to adopt the ODF standard that already existed with multiple implementations (and continues to act as a hub for alignment with other international work like China's UOF standard), but to rush their own product specification into the standardization process. They have over the two year process done a remarkable amount of work to bring the specification through ECMA to ISO, and have made great gestures to enable others to support the Microsoft specification. Microsoft is an adjudicated monopoly in the United States. The EU continues to investigate possible abuse of their market dominance. (Market leadership and innovation are not what's being punished, but rather the abuse of a dominant position.) Microsoft can complain all they want, but the practices that enabled their success continue to plague them. We cannot collectively rewrite history. Microsoft is indeed held to a different measure. They have forfeited some of the freedoms that other companies enjoy. In many ways, they have lost our trust. One can not judge Microsoft's newly declared preference for "openness" against the work they've done promoting their own product specification, but against their continued refusal to adopt ODF. In the end, OOXML as an ISO standard (with its attendant market confusion) will best serve the needs of Microsoft over its customers, and that's a shame. Andy Updegrove has an excellent essay on his blog as we go into this week's ballot resolution deliberations. He takes a different approach. In it he argues that a particular class of standards should be held to a higher bar for acceptance, because they enable fundamental technology access in the world going forward. He makes an compelling case for why OOXML should be flunked out of the ISO process. This promises to be a fascinating week. Stephen O'Grady recently interviewed and reviewed Bitrock after I introduced he and Erica Brescia, Bitrock CEO. I thought it appropriate to describe why I think what they build is important and cool from both a technology and business perspective. Bitrock builds one-click installation technology for software packages that accounts for all the packages's dependencies. The packages can be installed across multiple platforms including multiple Linux systems, Mac OS X, Windows, and Solaris. The company provides this service to ISVs, so if you're a small ISV using open source assemblies in your solution, Bitrock has the experience and technology to automate this expensive product engineering step for you. This is the first important realization. Too many companies still think that "installation" is "easy" and leave it to juniors, co-op students, and others that haven't the experience to understand how hard it is to get right (and get right for dependencies and updates), and then it's too late and they're eating the re-engineering cost to solve the problems and the customer cost in support calls, image, and good-will. Bitrock solves this problem for their ISV customers. A number of key ISVs in the open source world use Bitrock services this way, including KnowledgeTree, Jaspersoft, MySQL, and SugarCRM. But one-click multi-platform installers is just where the Bitrock discussion begins. A lot of the value in the business of open source software comes from the subscription network offering made by a vendor. It started as a security and administration discussion with Red Hat Network and Novell/Ximian Red Carpet. MySQL built on the idea with the MySQL Network. These were all ways to expand beyond the idea that Open Source Business Models = Selling Support and Maintenance. This is where a lot of value (and business model innovation) lies, well beyond the reach of the historical closed-source packaged software companies. Stephen points out concerns about how an ISV might abuse this ability. He even uses the dreaded "phone home" expression. I think this is less of an issue. While we have certainly bashed on the likes of Microsoft for possible abuses in this space, we haven't laid similar crimes at the feet of Red Hat, Novell, or MySQL. I think what very much matters is how an ISV packages their service, respects and protects their customer relationships, and positions and sets the expectations around their products. This is not a gun (which exists to shoot things regardless of motivation) but a workbench on which you can build things. The Bitrock Network Service is just the beginning. There are some great things that Bitrock is doing to release their installer build tools, as well as even more brilliant ways that the Network Service can work for enterprise customers (and further supporting the ISV). I realize this sounds a little too exuberant even for me. ("It's a floor wax! It's a dessert topping! It does Julienne fries!") What is exciting for me is that it's a coherent collection of technologies with a consistent set of supporting business models. Disclaimer: I've been watching what Bitrock has been doing for the past year under non-disclosure. They are not a client of mine, but I jumped at the recent opportunity to sit on the Bitrock advisory board. 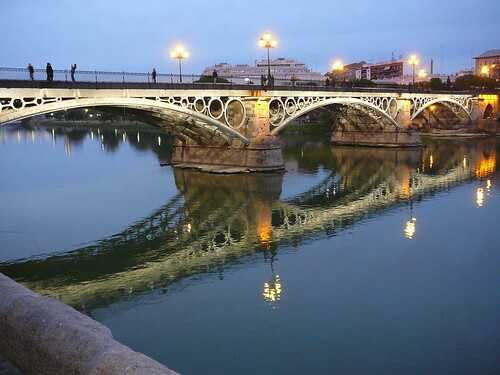 The main development hub for Bitrock is located in Sevilla, Spain, not far from this bridge. Would you do Open Source Marketing for Microsoft? [Updated 2008-02-14, 20:15] Sandro also posted on the subject. Microsoft’s partners team through its NXT initiative launched a campaign focused on open source ISVs in 2007 in conjunction with the Open Source Business Conference. The campaign is designed to encourage ISVs to explore how best to deliver their solutions to customers in the Microsoft world, recognizing that many high profile open source projects have 30%-50% of their installed base in the Windows world. The Microsoft program works through partners to assist ISVs. Review the ISV’s business model, solution offering, and channel delivery plans. Determine the best approach and plan to expand business in the Windows marketplace. Map Microsoft partner programs that best serve the ISV to their needs. Microsoft wants to expand the program this year, and Sandro Groganz and I are considering working together to join the program as a partner through his company. Sandro set up InitMarketing as a consultancy that develops marketing strategy for companies that use open source software in their solutions to customers. Sandro’s executive experience at eZ Systems and Mindquarry and as a PHP developer serve him well here. I’ve done strategy work for and with a number of open source related companies, built a product that used a breadth of open source software covered by a variety of licenses, and spent five years at Microsoft so have some understanding of the organization and its culture. As Sandro and I investigate the program, we are not without our misgivings. Do a search for “open source” on the main Microsoft partner site and you discover mostly anti-open source competitive material in the initial search results. Do the same search on the NXT partner site and you see a set of open source friendly case studies. (I’ve blogged elsewhere about the Microsoft message conflict problems.) And non-IE browsers don’t always render the site well. And some parts of the partner world want you to install Silverlight “[i]n order to view the rich media content on this page ....” None of this is encouraging to the average ISV living in an open source world. But this is also our opportunity. The Microsoft programs were developed out of a culture of “open source equals Linux” and anti-Linux competitive work and sometimes reflect that history. The NXT program is working to recognize the economic reality of the wealth of free and open source software running in the Windows world today. We have an opportunity to open the discussion with the ISV team about what open source software actually means on the platform. We have the opportunity to inform the business to mutual benefit. Sandro and I believe that we can start a more transparent discussion with Microsoft’s ISV team, starting here and now. We’re excited at that opportunity. The ISV and open source teams at Microsoft are open to this discussion. We’re curious what the rest of our readers in our business community think. Please share your thoughts below. Last week, Mary Jo Foley offered commentary on Microsoft's open source software strategy with respect to independent software vendors based on an interview with Microsoft's Sam Ramji. Matt Asay provides good colour commentary on his blog. Each post focuses on the trustworthiness and competitive history of the company. Let's look at things from a different perspective. JBoss: Claimed 50% deployment on Windows when they signed a partnership deal with Microsoft that included technical collaboration in September 2005. SugarCRM: Claimed 35% deployment on Windows when they signed their technical collaboration deal with Microsoft in February 2006. While Eclipse itself isn't a company, many ISVs build businesses around the Eclipse project. Alfresco: Claims 30% deployment on Windows according to their internal study published June 2007. MySQL: Claims 40% download MySQL for Windows. If Windows is one of the platforms you support, there should be nothing stopping you from considering joining a Microsoft ISV partner program. They provide lots of material and information to make it easier to develop, market, and sell on Windows than doing it all on your own. It absolutely benefits their growth. It benefits yours as well. To provide the best possible experience for your customers, if the Windows version of your applications needs to use Active Directory, Microsoft Operations Manager, or any other Microsoft specific technology, then I'm going to assume you'll best serve your customers and architect the application accordingly for multi-platform development, deployment and support. We have been architecting applications to support multiple platforms for decades, and it's easier today with common tools and languages (most of them open source), and standards support across platforms. Again, better to join a Microsoft ISV program and cheaply get access to the best technical information possible for the platform to support your customers. Some consider "doing business with Microsoft" tainted. There is no excuse for the behaviour we all saw from Microsoft with Netscape, or Sun with Java. If not for the high profile of the last U.S. Department of Justice investigation, the preponderance of email, and the ease with which one can search it, we wouldn't have such wonderfully embarrassing email examples that demonstrate how some people inside Microsoft think. (It makes you wonder what embarrassing gems are sitting in the email queues of other companies that haven't had this level of public legal scrutiny.) But most companies aren't in a position to demand their customers shift platforms. Even MySQL AB supported the SCO Openserver platform better to support customers. There are several things to understand about partnering with Microsoft that have a lot to do with the history and culture of the company. Microsoft was the PC software company, i.e. Microsoft customers had enormous deployments of small footprint inexpensive machines, versus the big server company (1990s) with far fewer big-iron multi-processor machines, versus the mini-computer company (1980s) with fewer less powerful systems, versus the mainframe company (1970s) with fewer still very large machines. While today a company will rack out thousands of blade servers in their back-room big-iron environment, in the 1980s and 1990s they didn't. Microsoft developed programs throughout their channel sales and marketing organizations to enable them to scale their growth. Their margins were completely different from the other large software companies (e.g. SAP, Oracle) or UNIX OEMs. So a VMS or UNIX ISV may have seen OEM staff arrive on site to help migrate or tune an application to the platform because of the margins involved in that business, but Microsoft had to create a program to enable their DOS then early Windows ISVs to get access to expertise differently. Starting an ISV that developed PC-related software required a far smaller capital outlay and so there were a lot of such companies. Programs like MSDN were created. The ISV programs were by definition information-intense but engagement-soft. It was the smartest way to correctly serve both their ISV partners and their business model. Hardware, software, and the Internet evolved. Windows became Windows NT has become Windows Vista and Server growing into the data centre. The big iron UNIX server world is evolving into scaled arrays of Linux servers. While these worlds collide in the data centre, the financial success of Microsoft remains tied to a culture of scaled programs. If you're an ISV that is used to the way IBM, Sun, or HP treat you, you may be surprised by a Microsoft program's lack of personal engagement. There's another cultural practice that contributed to Microsoft's growth and success through the 1990s and that effects partner programs (and customers alike). Employees were allowed, indeed encouraged, to regularly shift positions within the company. In the early days it kept smart people that might be prone to boredom fresh and ensured culture wasn't lost through the employee leaving the company. That practice is still considered a strength today. Scale-out programs (not tied to specific people or relationships) supported this model. In the end, do what makes sense for your customers. Join the Microsoft ISV program if it makes business sense. Use the materials that help your business grow and ignore the rest. Do it with your eyes wide open and your expectations set. Best of luck!